Tradition has such a strong voice in our festive meals and celebrations – what we do and don’t eat, how we eat it, how we prepare it. When I started being more observant and proactive in keeping kosher, I discovered that I resented meat meals. I love cheese and dairy (especially desserts) so ardently that it seemed unfair to give up my cheesecake in the name of mediocre, previously frozen meat. Nowadays there are are fantastic new companies offering organic, sustainable, delicious, all around amazing kosher meat but back then, in the distant past, that wasn’t the case. And so, I began exploring the other side of the kosher spectrum – the cheesy, creamy, eggy, fishy, veggie side! All of a sudden there were beautiful, affordable, luxurious options! 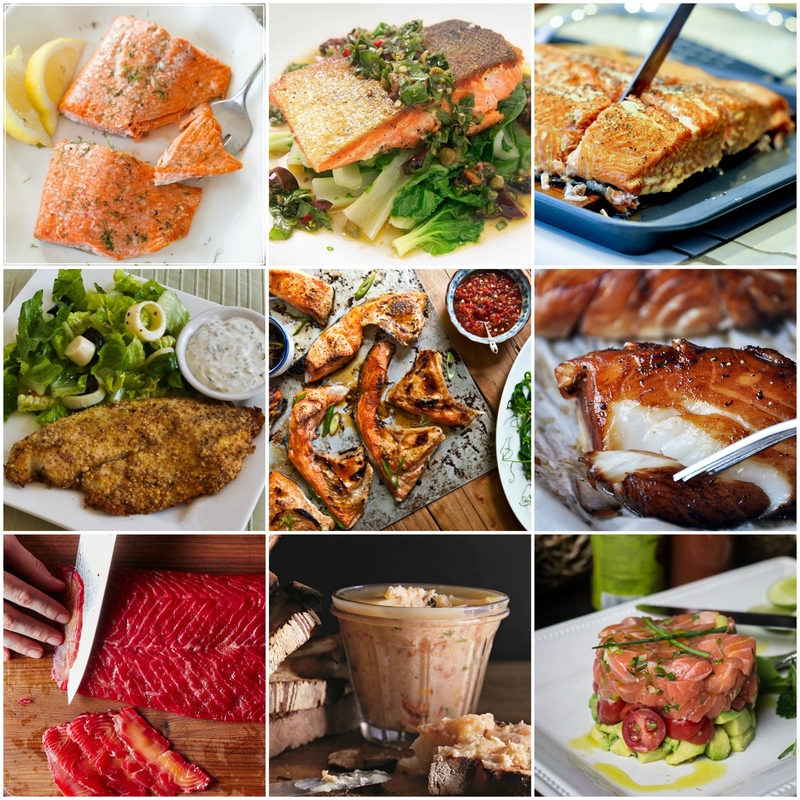 Living as I did in the Pacific Northwest, the fish counters stretched before me, replete with bright salmon, rich halibut, tender cod, and flavorful trout. Quality vegetables at the supermarket and farmers markets emitted their beautiful glow and the cheese counter beckoned. My vegetarian friends had an easier time eating at my table and my pocketbook was less strained. And so, most of my festive meals became, and remain, dairy/parve. How to Cook Salmon in the Oven – Simple and easy. The perfect way to prepare beautiful fish quickly. You could use this as an opportunity to add an interesting sauce like homemade tartar sauce or Heidi Swanson’s spicy lemony coconut sauce. Crispy Salmon – This recipe covers the technique to make beautifully crispy salmon as well as the accompanying steamed bok choy and basil caper relish (we all know how much I love capers!). You could also make this with mustardy lentils for an earthier, heartier approach. How to Grill Salmon on a Cedar Plank – If you have a grill, you should do this. While you’re at it, grill some corn or butternut squash! If you do want to try making a whole, smaller fish, grilling is a great way to do it. Almond and Parmesan Baked Tilapia – This low-carb take on crispy breaded fish is delicious both fresh from the oven and as a cold dish the next day. It uses cheese to bind the almond meal “breading” and would be so delicious with a crisp salad. Also see my take on a classic French fish dish. Broiled Fish Collars with Citrus Soy Sauce – This is the closest I will get to putting a fish head on the table (if it isn’t on a whole fish, of course). Economical and very tasty, fish collars can be found at good fish mongers or asian grocery stores. Baked Honey Marinated Cod – A great and topical use of honey in this dish! Marinate it for 24 hours in the fridge, then bake for 7-9 minutes. I would serve this with garlicky green beans. Beet-Cured Salmon – This definitely take some preparation, but in my book it is totally worth it. Cured salmon or lox are one of the easiest luxury foods to make at home, and can be used in so many ways. You could wow your guests with a whole fillet or side of salmon or slice it ahead of time and serve it as an hors d’oeuvre on crackers, challah crostini, potato or veggie chips, or even little latkes! Salmon Rillettes with Horseradish – I love rillettes. They hit that perfect balance of creamy decadence and spreadable heartiness. I would make a thin challah to slice into crostini-like rounds and serve it along side the rillettes with some crunch pickles. If you want to serve this with a meat meal, or just don’t want the dairy, you could replace the butter with coconut or other mild oil and the crème fraîche with high quality mayonnaise or soy-based sour cream. It won’t be the same, but will still be delicious. Dorie Greenspan’s Salmon Tartare – You will need an extremely reputable source for raw, sushi grade fish. I know that the Seattle area has several, as does the Bay Area. When you have that beautiful fish, the rest is easy and the result exceedingly refined. You’ll need some side dishes and desserts to go with these dishes, right? Stay tuned for those posts including my rumination on how on earth it could be possible for someone to dislike honey cake.